Is this the year that you got “that” class? The thing I’ve found with difficult classes is you have to change your management system & incentives fairly often. The systems lose their effectiveness quickly with a class with this type of chemistry. One of my favorite incentives is Friday Fun Day (F.F.D.)! It doesn’t cost any money and it can be academic as well as fun. First of all, you need to be a really good saleman . . . make your first Friday Fun Day seem like it’s going to be the best thing since sliced bread. Plan something extra special . . . can you borrow special games/computers/ipod touches from other teachers to use this week? 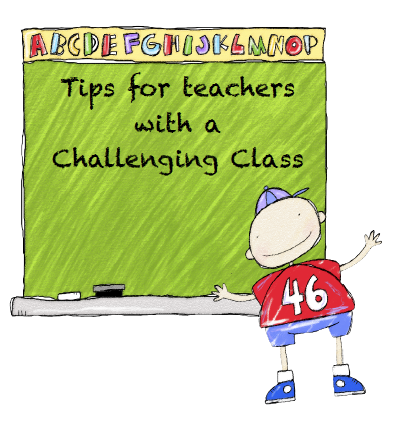 If not, think of something high interest that your challenging students would really want to do: heads up 7-up, chalkboard races, around the world, flashcard relay races, or watercolor painting to music your students bring in. Once you’ve sold Friday Fun Day, you explain that in order to EARN F.F.D., you can not get more than X number of behavior marks this week. In the beginning, students can have a high number of behavior marks and still earn their way to F.F.D. But, as you train them in your behavior expectations, you will lower your tally marks one a week until you get to a reasonable amount (3 or 4 per week). Students who don’t earn F.F.D. will write a note to their parents telling their parents why they didn’t go to F.F.D. and their plan of action so they’ll improve their behavior the next week. The parents have to sign the note and the note has to be returned by Tuesday or it is one behavior mark. After they finish writing the note, they put their head down for the rest of the time. My F.F.D. usually last 20-30 minutes at the end of the day. I try to do different things each week. Sometimes I give my class a choice and they vote for the one we do that week. If you want to add a class-wide incentive to F.F.D., write 30 on your white board on Monday. Thirty means that as of Monday morning everyone will enjoy 30 minutes of F.F.D. When you have transitions throughout the week (cleanup for lunch, turning in homework, etc.) you tell your class that they have X amount of minutes to complete the transition. If the class finishes early, those minutes are added to F.F.D. But, if a transition is too long, F.F.D. minutes are subtracted. You can also subtract minutes for talking during lessons. You will be amazed at what positive peer pressure can do! These are great questions. I'm going to write a blog post about it because I'm sure other teachers have the same questions, too. I like this idea a lot! The thing that I get stuck on is how to communicate to the children that they are losing points. I always feel like such a bad guy when I take points away. How do you say it so it puts the onus on them? I am a new teacher, and last year I used this system with my rambunctious Freshman students. Since we have class periods, I allotted each class period 5 points each day. Misbehavior removed those points. On Friday, the total number of points translated into minutes of "free time" that they could use to play board games, Legos, talk with friends, catch up on homework for the next class, or even sleep! After Christmas break, I stopped using it because it had lost its effectiveness somewhat (but also due to my needing the instructional time before state testing). Overall, the students responded well to it, and if the whole class decided to plot against me, then It was easy to punish them quickly and justly. I can't tell you how satisfying it is to hear a whole room stop breathing when you erase ALL of the points. That also means that you don't have to spend as much time doing after-school punishment, as well, which is an added bonus for busy teachers! One tip for teachers trying this method is to make sure that classes who have been really bad all week are made to work like slaves on Friday. Give them an essay or a quiz to complete. No talking, no social interaction at all–just hard labor. The more work and misery you pile on, the better. Next week, they will take that loss of fun time a LOT more seriously!! !